This past week I (Michael), along with my colleague Duane Guthrie, had the privilege of spending the week with a group of Pastors from Payatas. Payatas is a Barangay (community) in Quezon City (Metro Manila) that is estimated to have close to 500,000 people making their homes there, thus making it one of the most densely populated Barangays in Metro Manila. Also, Payatas has a 50 acre dumpsite which is the largest open dumpsite in the Philippines and is the reason why many refer to Payatas as ‘Smokey Mountain 2’. Many people in Payatas depend on the dumpsite to provide their livelihood. They do this by selling or using the garbage they salvage from the dump as a way to provide for their families. It is not uncommon for pastors to be paid very little (or not at all) due to the limited financial resources of churches in urban poor communities such as Payatas. This means they have to find other ways to earn money to support their families. Often times they will start a small business as a means to earn money for their families. For example, one of the pastors I met during the week had a small business along with his wife, making & selling Ice Candy (basically like frozen yogurt and fruit blended together to make a delicious cold treat). They also catered one of our lunches by making Adobo (meat cooked in vinegar, soy sauce & garlic) and Rice as a way to earn further income for their household. 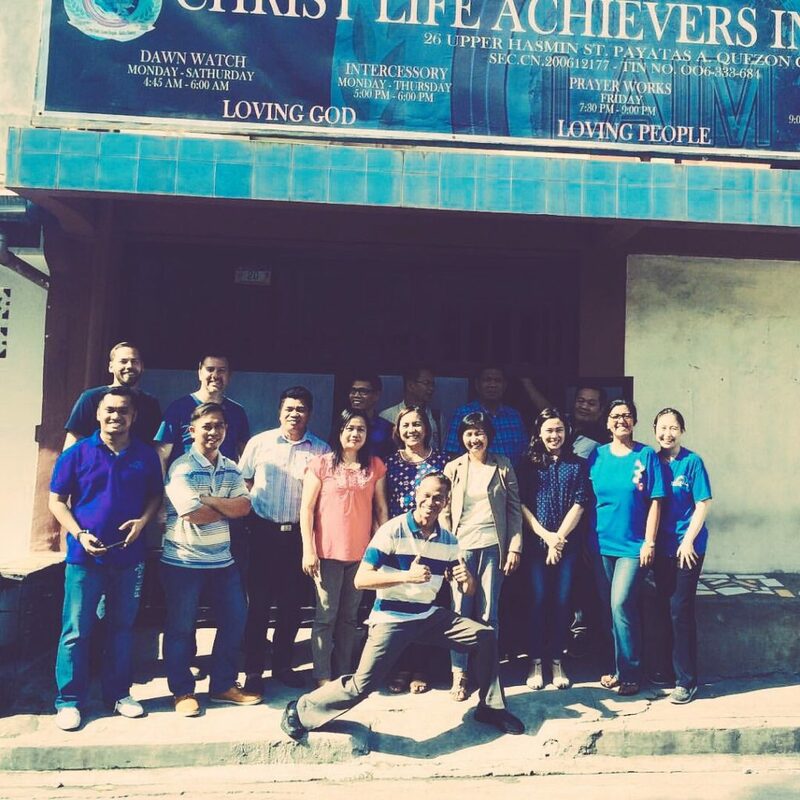 We spent the week at a small church called CLAIM Church (Christ Life Achievers International Ministries) with a group eager to learn more about business and how business can impact the Kingdom, and their churches, by helping to spread (in Word and Deed) the Gospel to others. The training was put on by the Missional Business Centre (MBC) with support from Canadian Baptist Ministries (CBM). The purpose of this five day course was to begin the process of training this group of pastors to become trainers, who will then use what they’ve learned to help train others in their churches and communities to start small businesses. One of the pastors whom I had the opportunity to talk with over merienda (snack time) was Pastor Tom. Before he became a pastor, Tom had his own business that was very successful. However, after some serious health issues, Tom was forced to close his business. During his recovery, Tom felt that God was calling him to become a pastor and to use his past business experiences to help others in his church and community – and that is exactly what he did. Pastor Tom now serves as part of a ministry team giving leadership to 30 churches. The focus of his leadership is on ‘Marketplace Ministries’ and leadership development. He is a passionate man with a deep concern for others and a heart that desires to see people connecting their work with their faith. As I sat and observed the interactions of this group and considered the impact of the training they were receiving, in their lives and the lives of others, it was a wonderful reminder to me of the tremendous impact that business (and our daily work) can make in the lives of others…when we become aware of how our faith and our work intersect. One evening, as I was travelling back home from Payatas, I was picked up by a Grab-taxi driver named Joemar. We began to talk and before long he was sharing with me about his past. He shared that for many years he was turning to drugs and alcohol for happiness. He was spending all of his money on these bad habits even though he had a wife and two young children at home who could use the money for things like food, clothing and education. Joemar’s life was spinning out of control. Thankfully, Joemar eventually met a man who told him about Jesus and how he could have a personal relationship with him. Joemar gave his life to Jesus and his life has never been the same. Joemar made a commitment to God that if he was able to save up enough money to purchase a car (so he could be a for-hire driver), he would do his best to be a witness to his customers about the transformation that occurred in his life because of Jesus. Joemar is a wonderful example of a follower of Jesus being aware of how their work and their faith intersect. What an amazing challenge for all of us! Have you considered how the Gospel impacts your work? In what ways do we allow our faith to impact the way we do our work? The way we interact with others? Do we see our work as a way to demonstrate the Gospel of Jesus to others through our words and our deeds? Each of us have the opportunity to share the hope of Jesus Christ with others as we go about our work! Please pray for this group of pastors as they continue to learn about small business and as they begin to implement what they’ve learned into their ministries with others. Please pray for Melanie and I, and our CBM colleagues as we continue to look for ways to engage with people in the marketplace and as we seek partners to work with. Please continue to pray for us as a family (especially our kids), as we each struggle with the adjustment of life here in different ways and at different times. God is faithful and we certainly feel His presence and your prayers!